Debut look at Sony Japan's PS Vita RPG sequel. Members of the Japanese press went live today with first previews of Sony Japan’s upcoming PS Vita RPG sequel Ore no Shikabane wo Koete Yuke 2 (Over My Dead Body 2), which is set to go on full display at next week’s Tokyo Game Show. Here’s our summary of what there is to know. Scroll down for screenshots. You can use the PS Vita’s camera and facial recognition capability to take a picture of yourself and have it recreated in-game. The character Ko-chan will support you as Itsuka did in the last game. The character graphics are now rendered in 3D. The inside of the labyrinth is 3D, but the camera is fixed. 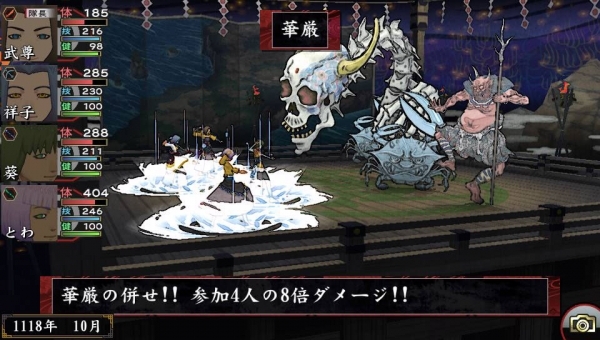 The systems of this new game will follow in the style of its predecessor: there will be simple encounters; if you run your strength will decrease; the passage of time is marked by 8 flames and various bonuses are available – for example, if the red flame is lit rare items will become easier to get during Fever Time. The battle scenes are rendered in 3D. The camera angle is a little slanted and taken from behind. The animations of the attacks and actions are now flashy and powered up. Nueko from Masuda Shouji’s novel ‘Onikiri Nueko’ will appear. Just as in the last game, you will defeat enemies and use the accumulated points to marry one of the dieties and make a child with them. The spirits are also rendered in 3D and so their forms and movements are something to see. The children you raise will have faces inherited from their parents. Of course you can name them too. In the bottom right of the screen there is a camera button for you to use to take photos any time. In the final release, we are planning to enable uploads of these photos to Twitter. There’s nothing connecting the stories of either game, but the world is the same – only set 100 years into the future. The art in the logo’s “2” has been inspired by woodblock prints. There were two concepts we had for this game: 1) to promise a style of fun worthy of a sequel, and 2) to create a new enjoyability, as well. There was a strong call from players to be able to manipulate the faces of characters through inherited traits, and so we modeled each character in 3D. Speaking of character faces, we’re trying an interesting experiment with QR Code, but it’s still top secret. We’re picking up a lot of requests from players via surveys, Twitter, Mixi and 2ch. If three people come up with the same request, we’ll take it into consideration. Making the 250 upper limit of the family lineage higher has been one request we’ve gotten quite a bit. In the new game you’ll be able to register up to 1024 people. A lot of people have also asked for more save files. This time there will be four save files available, but you’ll only be able to keep one save file per name. For those players who are new and don’t know what to do, we’ve lowered the hurdles considerably. The supportive Ko-chan will offer a lot of detailed advice. Ko-chan’s hair will change with the seasons, with a winter / spring style and one more for summer / fall. Right from the start three jobs will be available to choose from. Just like before, instruction manuals can be picked up in a variety of areas. The appearance of the labyrinth will also change with the seasons. In the previous game, battle techniques were divided into two types: those with three levels of development and those with four. However, in this game, everything has been unified into the four-leveled type. Princess Mana has an especially strong technique on the way. There will also be enemies who try to match your techniques. The “strongest equipment” command will consider attributes and character parameters and decide what items are best to equip, even down to the smallest numbers. We`re also preparing a command that packs the bag you carry into battle and uses the items inside to automatically heal your characters. On the easiest mode it will probably take about 20 hours to complete the game. We`ve now added the “heaps” mode, which is somewhere in between the previous “addicted” and “light” modes. There were many players who liked burning the red flame in “addicted” but who otherwise played in “light,” so we created this new mode for them. This is a pretty tough system to break, even if you try. You`ll find it will be pretty difficult to reach its limits. Among the gods, some will have special features like cat ears. Although the likelihood is very low, it is possible to create a family of cat eared people. It`s possible to develop the town by doing some heavy investing in certain stores (for example, the item shop or drug store). If you do this, you`ll find your town lined with stores of that one type. Players choosing to play in this way will find their towns growing differently from each other. Depending on the style of play, the shape of the peninsula you live on will also change. With your boat you`ll be able to travel to the peninsulas of other players. Once there, you`ll be able to break into the labyrinths of other players that are further ahead of you in the game, shop in towns that differ from your own, or possibly interact with the gods other players have grown. View the debut screenshots at the gallery.